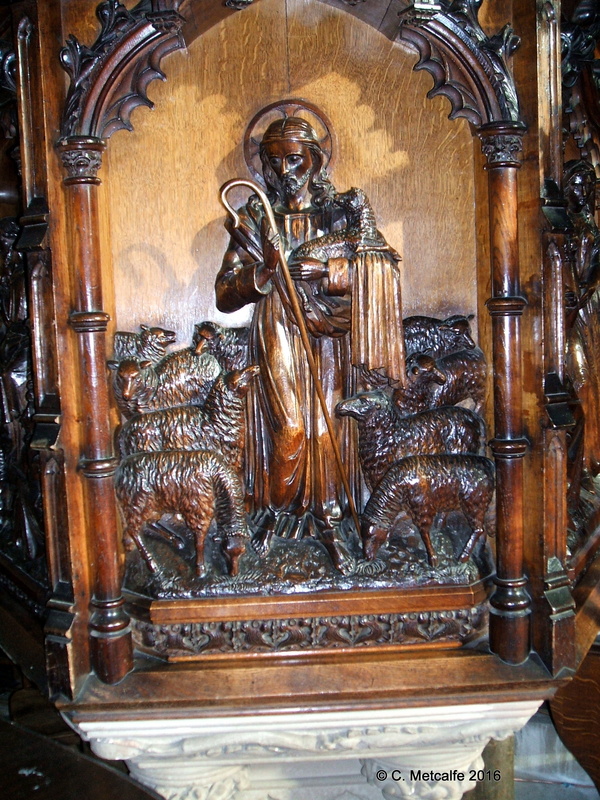 The present pulpit in St Swithun’s church stands just in front of the Chancel, and is decorated with beautiful carved figures and sheep in its panels. Children sometimes like to tou ch the sheep, because the woolly coats look so realistic. I have not been able to find what sort of pulpit there was before 1878, when the present one was was given. After the rebuilding, which took place from the late 1780s to the 1830s, the church resembled ‘a vast preaching box‘ with a flat ceiling. Sermons, apparently, lasted the best part of an hour and were delivered by a clergyman in a black gown, wearing mauve or black gloves! This detail comes from a church guide written in 1975. Then in the 1870s, the ceiling was raised and further alterations were made to the Chancel, including the creation of the choir stalls, the laying of the tessellated pavement and the installation of the East Window. This was given by Miss Elizabeth Clarke of Frampost in 1879. 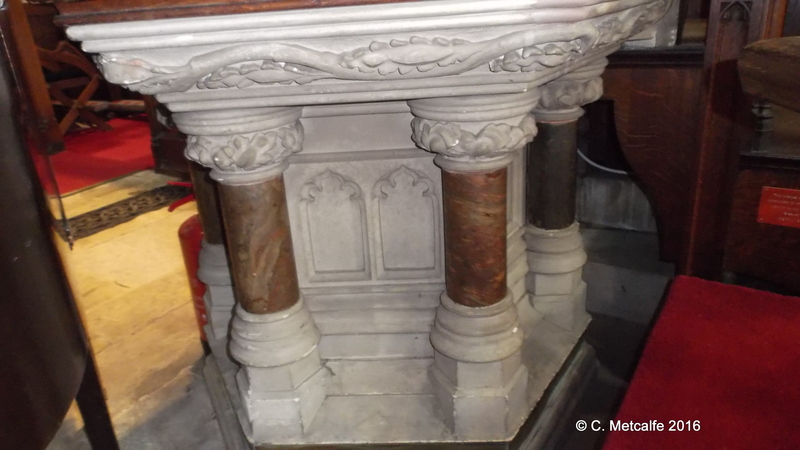 The pulpit base is of Caen stone, with Devonshire marble columns at the angles of the hexagon. The body of the pulpit is of carved oak. The 4 most visible panels have identifiable subjects: The Good Shepherd, with the tactile sheep; The Sermon on the Mount, The Woman of Samaria and The Risen Lord’s Challenge to Peter. To the Glory of God, this pulpit is erected by desire of the late George Elliott Clarke, Esq, of Frampost in this parish, in loving memory of his wife, Rebecca Worrell, his only son, Foster Mayer and his daughter Marian Crawfurd Louis, July 1878.